First let me say, I am not paid by Sitka Gear, nor do I receive any free stuff from them for my own use (although they have donated a few caps for contests). Any opinions you read here are my own and not influenced by outsiders. This season we purchased a complete Sitka system and put it to the test. For the most part the Sitka clothing or gear as they like to call it, performed flawlessly; but there is one fairly major shortcoming in my opinion. 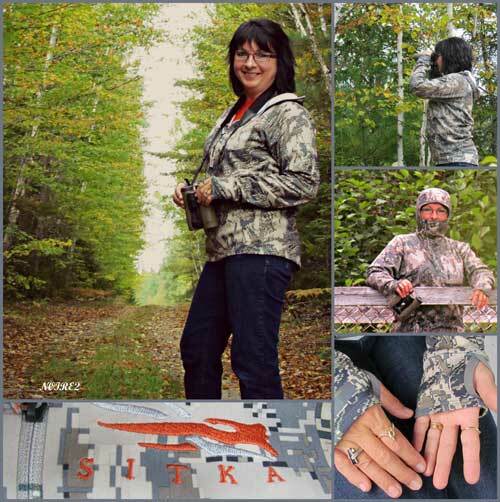 When I first saw the Sitka product line at a trade show a few years back, I was pretty impressed. I picked up some of there free literature and took it home to read. I read about the development of the product and the "Science of Nothing"! I was impressed! Also knowing that the military uses pixels for their camouflage gear, I figured that the Sitka developers were onto something. For any of you who have never looked at Sitka clothing, you will be in for a bit of sticker shock. Sitka gear is not cheap! I purposely stayed away from Sitka gear for quite some time because I couldn't afford it. Now that I am in position to buy some better gear I bit the bullet and, after doing some more research, purchased enough clothing for my hunting needs for this season. Because I do most of my hunting from the ground I opted to go with the Optifade Open Country pattern. "The S I T K A Hoody that I received from last year "All About Moose" contest is very nice,comfortable and practical. It stops the wind from entering in the arms and if it's cold you can cover your head and even the chin. It clings to your body therefore it keeps the heat inside, which I enjoy especially in a cloudy and windy day." I must say, when I opened up my packages of clothing I was impressed. Looking over each item I found that Sitka Gear developers had taken feedback from their users and employed some great features into the clothing. Things like having the drawstrings for jacket waistlines inside pockets so they don't dangle and get caught on everything. Hood drawstrings have the ends tucked away so they won't whip your face in the wind. Zippers that are covered so there is no skin contact with them. Pant waistlines have rubber liners so your shirts stay tucked in. Removable knee pads and much more. This is the list of what I purchased prior to the moose season. Proof is in what works! I think the pixel system is a winner! No question about that. I kept warm and dry in all but the wettest of weather, which for next season I am going to buy the Sitka Cloudburst Jacket and Sitka Cloudburst Pants so I can go and be dry in the sustained rain. I had some great hunting experiences while wearing the clothes this moose season. I called in several moose and... seemingly they didn't see me. That was the desired effect! One one occasion, I was sitting next to a pine tree when another hunter approached. I thought to myself, surely he'll see me... he is walking down the same trail as I did. You won't believe what happened! This hunter stopped directly in front of me and turned to face away from me. He proceeded to use his moose call, then unbelievably turned towards me and faced me. "Surely he'll see me", I thought! Looking straight in my direction (he was only 10-15 feet away) and he looked right past me! Not one bit of recognition... he then turned and carried on with his walk. 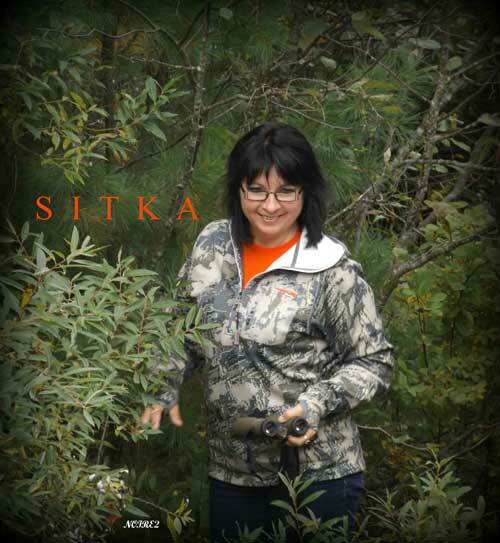 Yes this Sitka Clothing does what it says it will do... you will be hidden and comfortable. HOWEVER! I did mention there is a pitfall in this clothing lineup... and I am torn because of it. The Sitka system of hunting clothing really seems to be the gear that will give me every advantage that I want... all but one! When walking in dense bush this clothing is noisy! Run a fingernail or a branch across a nylon jacket and you will hear what Sitka Clothing sounds like when you push your way through a willow thicket or past a blueberry bush. It's downright noisy. Depending on the type (style) of hunting and terrain you hunt in, this may not seem like much of an issue. Where I hunt in Northern BC, the forests tend to be thick so there are lots of branches to rub against. In order to be totally silent, I prefer a fleece outer to my hunting clothing. This leaves me stuck between a rock and a hard place... invisible to the eye or invisible to the ear. 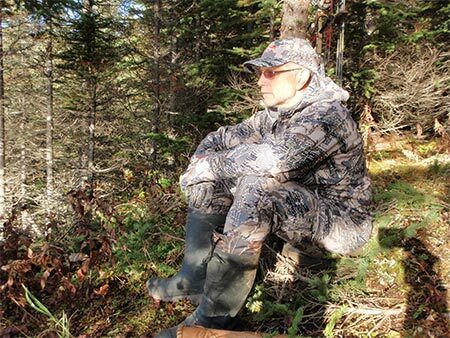 After considering the choices, in the end I will continue to use the Sitka Gear for hunting, although I am sure on occasion I will revert to my standard fleece hunting clothes on certain occasions. 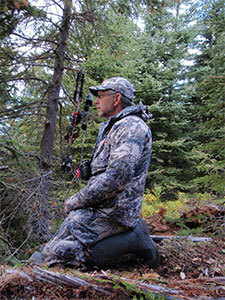 I highly recommend you check out the Sitka Gear product line and see for yourself.